Simple troubleshooting steps for MGB no-start problems. Turn of ignition, put gearshift in neutral, pull up hand brake. Open bonnet and locate starter relay. On the started relay jumper the brown wire on terminal C1 to the white/brown wire on terminal C2, the starter should run. If not, you have a bad solenoid, or bad connection from relay down to the solenoid coil. If you hear the starter solenoid click then you could have a bad starter. If it runs, then with ignition off, jumper brown wire on relay terminal C1 to the white/red wire on the relay terminal W1. 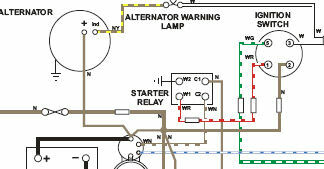 If the starter still doesn't run, then you have a bad starter relay. If it does run then I would suspect the ignition switch start contact, unless your car has a seatbelt sequential control system that is preventing the starter relay from activating. Comments on "Checking the Starting Circuit"
Previous owner of my new/old '70 BGT replaced the start relay and starter when she wouldn't start. Sold it to me 'as is'. Start relay was wired wrong. (ground to C1) Easy to diagnose with this article. Thanks Gil. My starter seems sluggish. In fact I seem to remember it would not engage and I would have to "push start" my midget. Easy to do but not desirable. I took out the starter and want to clean the brushes with fine sandpaper, like emory paper. Then I want to clean and lub the gear on the starter shaft that engages with the flywheel. There is also a spring that I guess is okay. What type of lubricant for the extension shaft and gear that slides to engage the crank?